Exporter of a wide range of products which include anti snack venom, bcg vaccine, oral polio vaccine, hepatitis b vaccine, influenza vaccine and hib vaccine. We are leading exporter and manufacturer of Anti Snack Venom. Standard Cobra Venom (Naja naja) makes the snake venom in the body of the ineffective patient. Anti Snack Venom exporter in India. We are leading exporter and manufacturer of BCG Vaccine. 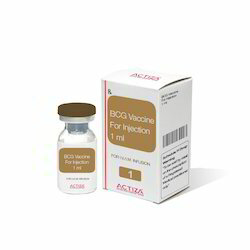 Bcg i.p vaccine belongs to a class of medications called vaccines. It triggers body’s natural defence system and prevents tuberculosis infection. It is also stops the progression of tumors which are located in urinary bladder. BCG Vaccine exporter in India. We are leading exporter and manufacturer of Oral Polio Vaccine. Oral polio vaccine is used to prevent polio. Oral polio vaccine is a vaccine.It helps develop immunity by initiating a mild infection. This type of infection does not cause illness, but it does stimulate the body's immune system to produce antibodies to protect against any future infections. Oral Polio Vaccineexporter in India. We are leading exporter and manufacturer of Hepatitis B Vaccine. Recombinant hepatitis b vaccine is a vaccine.It helps develop immunity by initiating a mild infection. This type of infection does not cause illness, but it does stimulate the body's immune system to produce antibodies to protect against any future infections. Nausea, Neuropathy, Pain, Paralysis, Abdominal pain, Anaphylactic reaction, Angioedema (swelling of deeper layers of skin), Convulsion, Diarrhoea, Dizziness, Fatigue, Fever, Headache, Decreased blood pressure, Itching, Feeling of discomfort, Meningitis, Muscle pain, Rash, Skin redness, Vomiting, Weakness. Hepatitis B Vaccine exporter in India. We are leading exporter and manufacturer of Influenza Vaccine. Influenza vaccine is a vaccine.It helps develop immunity by initiating a mild infection. This type of infection does not cause illness, but it does stimulate the body's immune system to produce antibodies to protect against any future infections. Flushing (sense of warmth in the face, ears, neck and trunk), Gastrointestinal disturbance, Decreased white blood cell count. Influenza Vaccine exporter in India. We are leading exporter and manufacturer of HIB Vaccine. Silt hibpro vaccine is a vaccine.It helps develop immunity by initiating a mild infection. This type of infection does not cause illness, but it does stimulate the body's immune system to produce antibodies to protect against any future infections. Nausea, Pain in extremity, Peripheral neuropathy, Joint pain, Body ache, Convulsion, Facial swelling, Fever, Injection site tenderness, Injection site pain, Vomiting. HIB Vaccine, Quadrivalent Vaccines/ Pentavalent Vaccin Vaccine exporter in India. We are leading exporter and manufacturer of Cholera Vaccines. Cholera Vaccine is a vaccine.It helps develop immunity by initiating a mild infection. This type of infection does not cause illness, but it does stimulate the body's immune system to produce antibodies to protect against any future infections. Cholera Vaccines, Quadrivalent Vaccines/ Pentavalent Vaccin Vaccine exporter in India. We are leading exporter and manufacturer of Human Rabies Immunoglobulin Vaccines. Human Papillomavirus Vaccine Type11 L1Protien is a vaccine. It helps to develop immunity by initiating a mild infection. This type of infection does not cause illness, but it does stimulate the body's immune system to produce antibodies to protect against any future infections. Headache, Nausea, Rash, Joint pain, Vomiting, Fever, Urticaria, Abdominal pain, Itching, Injection site reaction, Diarrhoea, Muscle pain. Human Rabies Immunoglobulin Vaccines, Quadrivalent Vaccines/ Pentavalent Vaccin Vaccine exporter in India. We are leading exporter and manufacturer of Typhoid Vaccine. Purified Vi Ploysaccharide Typhoid Vaccine is a vaccine.It helps develop immunity by initiating a mild infection. This type of infection does not cause illness, but it does stimulate the body's immune system to produce antibodies to protect against any future infections. Nausea, Diarrhoea, Fever, Headache, Rash, Urticaria, Vomiting, Gastrointestinal discomfort. Typhoid Vaccine, Quadrivalent Vaccines/ Pentavalent Vaccin Vaccine exporter in India. We are leading exporter and manufacturer of Rotavirus vaccine. Live Attenuated Human Rotavirus Vaccine is a vaccine.It helps develop immunity by initiating a mild infection. This type of infection does not cause illness, but it does stimulate the body's immune system to produce antibodies to protect against any future infections . Rotavirus vaccine, Quadrivalent Vaccines/ Pentavalent Vaccin Vaccine exporter in India. We are leading exporter and manufacturer of TT vaccine. Tt injection is a vaccine.It helps develop immunity by initiating a mild infection. This type of infection does not cause illness, but it does stimulate the body's immune system to produce antibodies to protect against any future infections. TT Vaccine, Quadrivalent Vaccines/ Pentavalent Vaccin Vaccine exporter in India. We are leading exporter and manufacturer of Trivalent Vaccine, Quadrivalent Vaccines/ Pentavalent Vaccin. Triplent 10 mg tablet increases the levels of chemical messengers in the brain that help in regulating the mood and treat depression. Trivalent Vaccine, Quadrivalent Vaccines/ Pentavalent Vaccin Vaccine exporter in India. We are leading exporter and manufacturer of Meningitis Vaccine. Meningitis act injection is a vaccine.It helps develop immunity by initiating a mild infection. This type of infection does not cause illness, but it does stimulate the body's immune system to produce antibodies to protect against any future infections. Dizziness, Injection site reaction, Fatigue, Headache. Meningitis Vaccine Vaccine exporter in India. We are leading exporter and manufacturer of TD Vaccine. Diphtheria Toxoid is a vaccine.It helps develop immunity by initiating a mild infection. This type of infection does not cause illness, but it does stimulate the body's immune system to produce antibodies to protect against any future infections. Neurological disturbances, Pain, Fever, Flushing (sense of warmth in the face, ears, neck and trunk), Decreased blood pressure, Skin redness, Tachycardia, Tenderness, Urticaria. TD Vaccine Vaccine exporter in India. We are leading exporter and manufacturer of MMR Vaccine. Measles Virus Vaccine is a vaccine.It helps develop immunity by initiating a mild infection. This type of infection does not cause illness, but it does stimulate the body's immune system to produce antibodies to protect against any future infections . Vomiting, Nausea, Application site redness of skin, Application site irritation, Muscle pain, Joint pain, Diarrhoea, Fever, Dizziness, Headache. MMR Vaccine Vaccine exporter in India. We are leading exporter and manufacturer of DPT Vaccine. Progesterone belongs to a class of medications called progestins (female hormones). It is used as a part of hormone replacement therapy to bring on the menstruation by decreasing the levels of estrogen in the uterus and replacing the natural progesterone in women who are lacking. Rash, Adrenal insufficiency, Vaginal discharge, Headache, Dizziness, Back pain, Increased appetite, Decreased libido, Pain in extremity, Abdominal distension, Sleepiness, Cushing syndrome, Vomiting, Nausea, Edema, Abdominal pain, Abdominal pain lower, Breast pain, Hair loss, Fatigue, Acne, Hot flushes, Thrombophlebitis, Diarrhoea, Irregular menstrual cycle, Cushingoid syndrome, Increased blood pressure, Depression, Mood changes, Nervousness, Constipation, Increased glucose level in blood, Breathing difficulty. DPT Vaccine Vaccine exporter in India. We are leading exporter and manufacturer of Anti Rabies Vaccine. Anti Rabies Sera Immunoglobulins is a vaccine.It helps develop immunity by initiating a mild infection. This type of infection does not cause illness, but it does stimulate the body's immune system to produce antibodies to protect against any future infections. Nephrotic syndrome, Pain, Anaphylactic reaction, Angioedema (swelling of deeper layers of skin), Injection site stiffness, Soreness, Tenderness. Anti Rabies Vaccine exporter in India.